The Estonian Weather Service is responsible for provision of meteorological service (forecasting and weather warning services) for international and domestic aviation within Tallinn Flight Information Region (FIR). 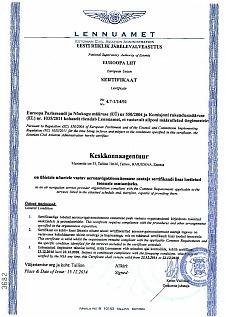 The Estonian Weather Service is a part of the Estonian Environment Agency (ESTEA). Our objective is contribution towards the safety, regularity and efficiency of international air navigation by supplying the operators, flight crew members, air traffic services units, search and rescue services units, airport managements and other customers concerned with the conduct or development of international air navigation with the meteorological information. We provide 24/7 forecasting and weather warning service to Kuressaare, Kärdla, Pärnu, Tallinn, Tartu aerodromes and within Tallinn FIR. Since 2004, the provision of aviation meteorological service has been certified to ISO 9001. 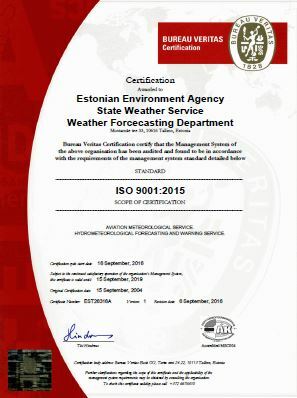 ESTEA is certified as a meteorological service provider according to Commission implementing regulation 1035/2011 of October 17, 2011.